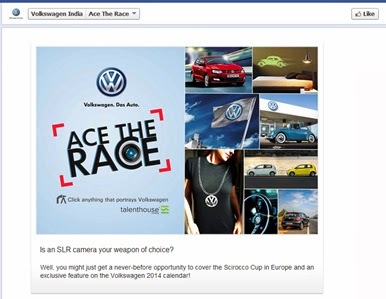 Volkswagen India is leveraging the mother brand’s association with the Scirocco Cup with their Ace the Race contest on Facebook. For the uninitiated, Scirocco is a compact third generation coupé from VW and the brand hosts a racing series called Scirocco R-Cup. This year Sandeep Kumar is the sole Indian rep at the race. As a part of the contest, VW is scouting for stellar photographic talent from India to cover the Scirocco Cup in Europe. The contest invites fans to share their high quality pictures featuring the essence of brand VW. Indicative themes were made available on the Facebook app to help participants. The best 5 entries will get to cover the Polo R Cup in Delhi and the final winner will also get an exclusive feature on the Volkswagen 2014 calendar. Presently the submitted pictures are in the voting stages. The app on Facebook is functional and easy to navigate with detailed instructions. The contest invites serious participation specially since the gratification is not frivolous. Check it out here.